Happy October everyone! Fall is in full swing and it is finally time for another installment of Bum Wine Of The Week! The Night Train Express got such an overwhelmingly positive response as the BWOTW for 8/29/14, that it catapulted itself to Bum Wine Of The Month status for September here at Bumming With Bobcat. Could that happened again this week? Only time will tell! Now that fall has officially arrived, it's time we get on board with the rest of the fall trends. Sadly there is no pumpkin flavored bum wine on the market yet, but don't you think that a "Pumpkin Spice MD 20/20" would be a huge hit? I think it would, so you guys better get on that! Since the pumpkin spice MD 20/20 flavor doesn't exist...yet....I am going to stay in the Mad Dog family and feature another old favorite that is guaranteed to be a hit at your next Halloween party. That is Peaches & Cream MD 20/20! 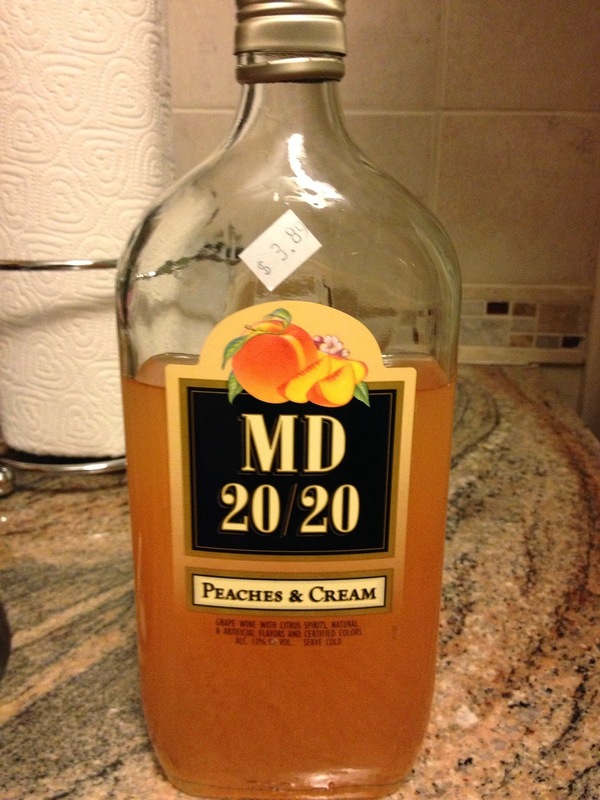 Peaches & Cream is another member of the MD 20/20 rainbow that is quite delicious and drinkable on it's own. I think that every time I have enjoyed a bottle of this, I have never felt the need to mix it or come up with some sort of bum wine concoction. It always gets rave reviews from the drinkers and is a requested party favor. You can drink it straight from the bottle and pass it around the room so everyone gets to enjoy! Taste the peaches...taste the cream...and taste whatever other chemicals are in that bottle! Delicious, right? Do yourself a favor this weekend and grab a bottle of Peaches & Cream MD 20/20. You can thank me later!